The Thrifty Mommy: Ever Use a Fabric Shower Liner??? It seemed like I was going threw shower liners like crazy... every month I would head out to The Christmas Tree Shops and purchase 2 liners for $3.00 (cheaper than $1.69 for only 1) then go home and replace the old one. 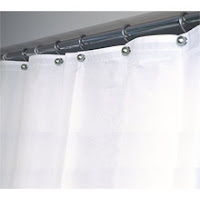 Not really a big deal, but then I saw in the Linens N Things ad one Sunday...Fabric Shower Curtain Liners. You can use them, wash them , then reuse them. I thought, this can save me an errand each month, less plastic to dispose of, and a nicer liner to look at. I thought, hey this may be a great thing to purchase!! I purchased it, it was $14.99 minus 20% off coupon plus tax. I headed home, hung it up...it was great for about 3 days...then I started to regret my purchase!! You see, we are a family of 4 with 2 kids....and we like to shower a lot, I guess. You see it would take a bit for the liner to dry, and then when it did...it would create small mold lines along the seam at the bottom...and a few mold specks here and there. Now, I did buy a white liner....(maybe at least with black I would not of seen the moldit...J/K). So I thought after a week, maybe it just needs a run threw the washing machine. That will take care of the mold spots. Wrong, then some of the mold spots turned yellow...and the mold line at the bottom just got a little faded. GROSS!! My daughter baths daily in the tub, and although the liner is not in the tub...it is along side of the tub and if she reaches for it....nasty!! It just grossed me out. I tried washing it again...with no luck. My supposed-to-be great purchase was not so great anymore!! So, about 10 days after I purchased it....I was back at LNT returning it!! This time the associate said "People are returning these frequently". Now, the truth is told!! I am now happily back to using plastic shower liners...and I will never again complain about the $1.50 I spend every three weeks to buy one!! It is well worth it...in my opinion!! !